Harvey Nichols is one of the most distinguished luxiurious department stores in the United Kingdom; with branches in some of the countries most impressive cities including London, Manchester, Leeds, Bristol, Dublin (Ireland) and Edinburgh. Despite Harvey Nichols being a chain; each store has its own character, that is highlighted by a unique charm that can only be truly appreciated by visiting the store itself. 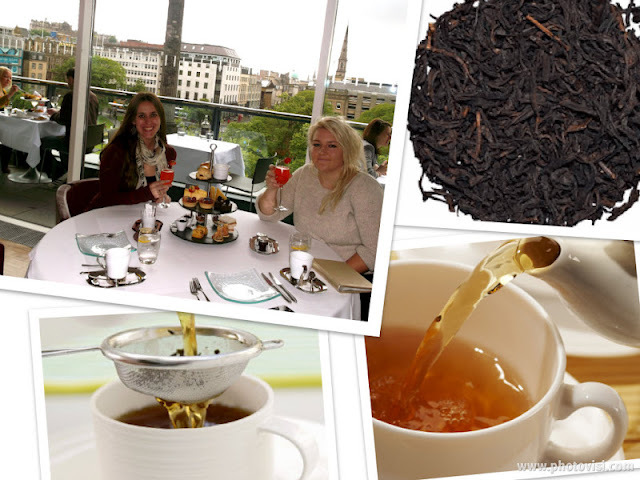 Every Harvey Nichols has a seemingly endless ‘whats on’ event listing from guests to choose from; so naturally being the self confessed afternoon tea addicts we are, we could not resist a visit to Harvey Nichols Fourth Floor Edinburgh to try their deliciously, divine afternoon tea. On entering the store it is impossible to not become captivated by the beautiful items on sale; as we decended up to the forth floor our excitement was almost childlike as the suspense built for what would be awaiting us. 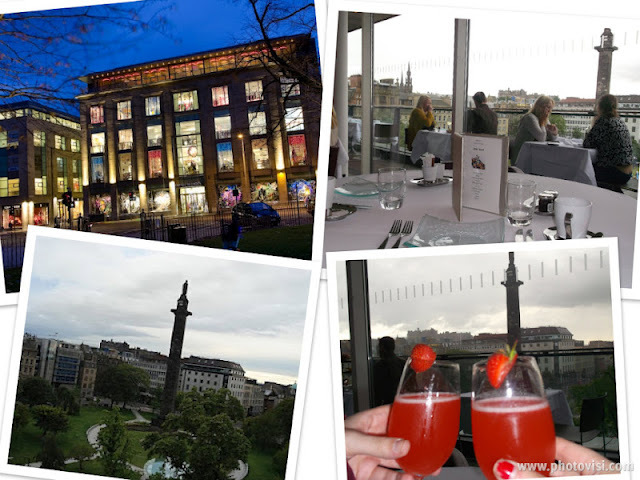 As we approached the enterance to the elegant, spacious restaurant our waiter greeted us warmly, enquiring about our trip to Edinburgh as we were shown to our table. The table was beautifully presented; with a crisp, clean white table cloth, beautiful modern tableware including clear plates with adorable little pots of raspberry jam and a knob of butter on a stone. Undeniably; the most captivating part of the Fourth Floor besides it’s beautiful interior is the fantastic views that are on offer from essentially any table within the restaurant or balcony. The restaurant has big, open windows which allows you to be captivated by the sights of this beautiful city. As to be excepted from such a prestigious name; the expectional level of customer care was evident from the onset. We were tucked into our table, with our napkins placed on our laps, we were then talked through the afternoon tea menu which inline with the seasons changes contents. On making our afternoon tea selection we were offered a glass of ice cold still or sparkling water with a slice of lemon before we were left to enjoy our surroundings. 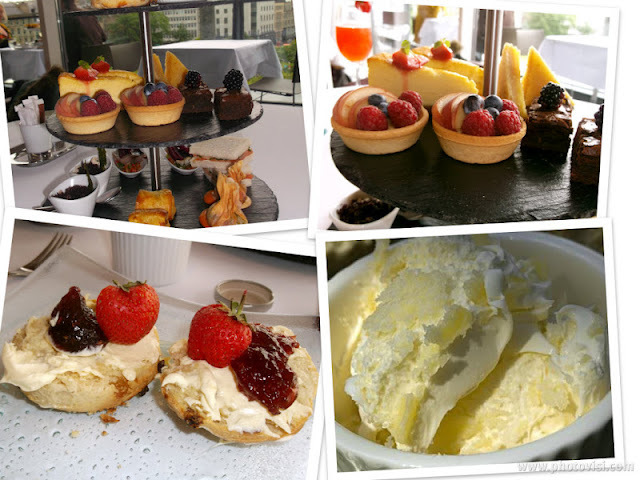 Our afternoon tea arrived on a three tier stand with a chalk board appearance; the contents of this afternoon tea was a complimentary blend of indulgence and classics. The bottom tier contained two of the following; Greek salad, sausage rolls, mackerel and pickeled beetroot and organic smoked salmon sandwiches. We were informed about the extensive care Harvey Nichols takes in selecting its ingredients; to ensure the taste is unparalleled. 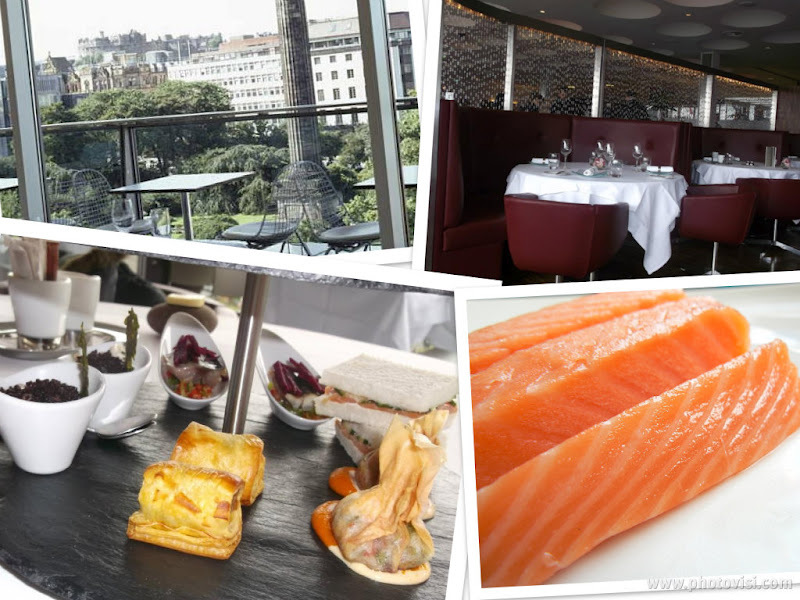 The mackerel in the afternoon tea is sourced from the North Atlantic ocean, and the smoked salmon is locally sourced from Scottish waters; most astonishingly the smoked salmon at Harvey Nichols was supplied at the Royal Wedding of Kate Middleton and Prince William! The next tier contained the following mouthwatering desserts; Lemon cake, chocolate brownies, Cheesecake and fresh fruit tarts. The final tier contained two, plump warm scones with an incredible aroma accompanied by a dish of clotted cream. We can honestly testify that every item on this afternoon tea was divine! The savories, although diverse and in many cases deviate from the traditional items served in an afternoon tea were incredible. The Greek salad was incredibly fresh with a wholesome taste, the mackerel had a delicious kick to it with chillies and the fresh pastry used in the sausage roll crumpled in your mouth. Our favorite item on this tier although close was the smoked salmon; we have never tasted anything so fresh and flavorsome and cannot recommend it enough! Keeping inline with our personal preference we ordered tea to accompany our scones and desserts. On the recommendation of our waiter, we both selected Earl Grey Lavender blue; which was incredibly refreshing. The desserts and scones were just as impressive as the savory tier; our favorite dessert was the cheesecake. One touch that we really liked, was throughout the afternoon tea, after each tier was complete our plate and cutlery were replaced. Our afternoon tea experience at Harvey Nichols was exceptional; the entire afternoon tea was faultness. We cannot recommend this enough!